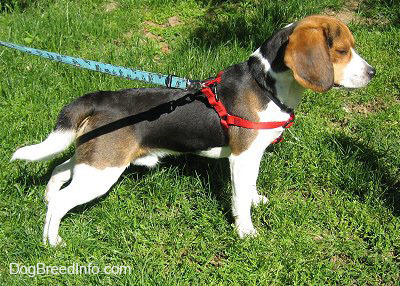 The Beagle is a sturdy, hardy little hound dog that looks like a miniature Foxhound. The body is squarely-built while the skull is fairly long and slightly domed. The square muzzle is straight and medium in length. The large eyes are brown or hazel and are set well apart. The wide, pendant ears are low set and long. The black nose is broad with full nostrils. The feet are round and firm. The tail is set moderately high and never curled over the back. The coat is of medium length, close, hard, sleek and easy to care for. Any hound-type of coloring is acceptable including lemon, tricolor, black and tan, red and white, orange and white or lemon and white, blue tick and red tick. 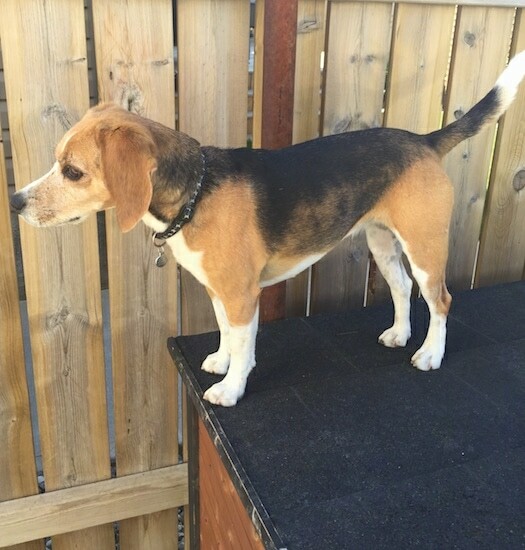 Beagles have a distinct howl / bay of a bark when they are on the hunt. 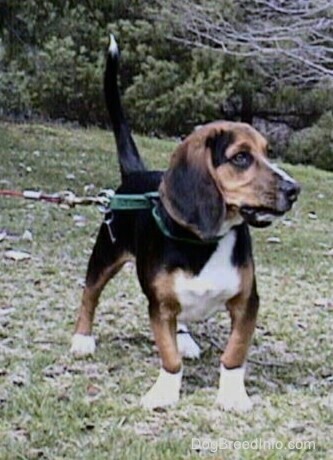 Video Clip of a Beagle's Baying Bark. 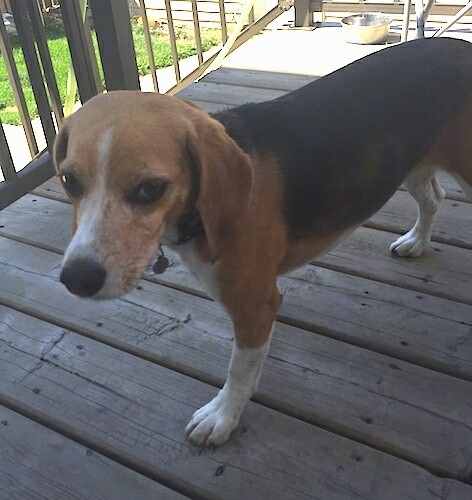 The Beagle is loving, sweet and gentle, happy to see everyone, greeting them with a wagging tail. It is sociable, brave and intelligent. 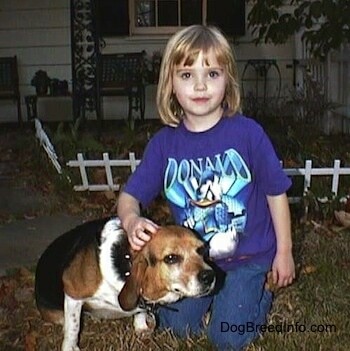 The Beagle is excellent with children and generally good with other dogs, but because of its hunting instincts, should not be trusted with non-canine pets, unless socialized with cats and other household animals when young. Beagles have minds of their own. They are determined and watchful and require patient, firm training. It is important you are this dog's pack leader and that you provide the proper amount of mental and physical exercise, including daily pack walks, to avoid separation anxiety. With enough exercise they will be calm. 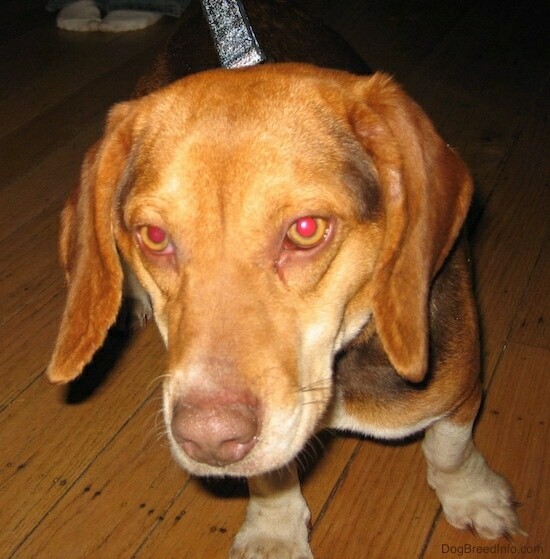 You can also purchase animal scents and play tracking games with your Beagle to help satisfy its instinct to track. The Beagle does not have a normal sounding bark, but rather a loud bay cry that almost sounds like a short howl. 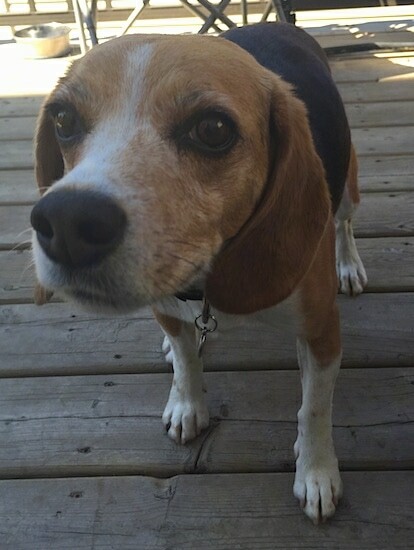 Beagles are curious and have a tendency to follow their noses. If they pick up a scent they may wander off and not even hear you calling them back, or care to listen, as they will be too busy trying to find the critter at the other end. Take care when letting them off leash that you are in a safe area. 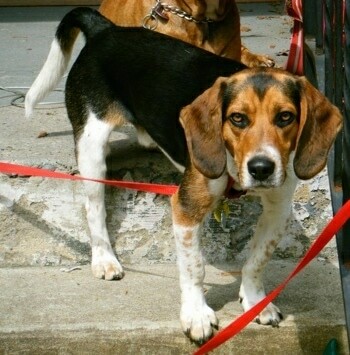 Beagles that are allowed to be pack leaders over their humans can develop a varying degree of behavior issues, including, but not limited to, guarding, obsessive barking, snapping, biting and destructive behaviors when left alone. These are not Beagle traits, but rather behaviors brought on by lack of leadership and/or exercise from their humans. The behaviors can be corrected when the dog’s instincts are met. There are two height classes, 13 - 15 inches (33 – 38 cm) and under 13 inches (33 cm). Some lines can be prone to epilepsy, heart disease, eye and back problems. 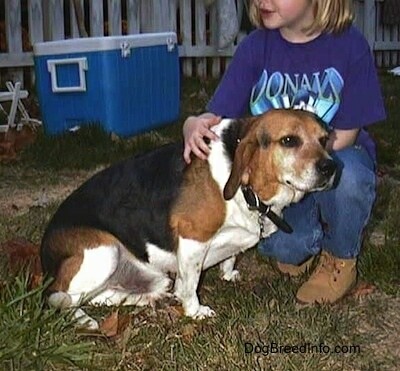 Also prone to chondroplasia aka dwarfism (warped front legs, like a Basset's). See an example of chondroplasia in a dog. Prone to mast cell tumors. The Beagle's smooth shorthaired coat is easy to look after. Brush with a firm bristle brush, and bathe with mild soap only when necessary. Dry shampoo occasionally. Be sure to check the ears carefully for signs of infection and keep the nails trimmed. This breed is an average shedder. 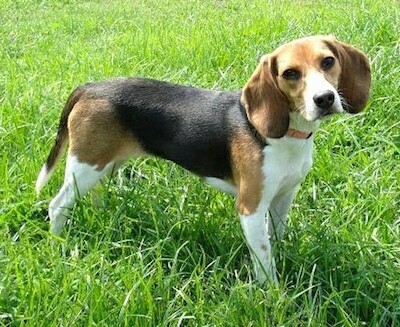 The first Beagles date back to the 1500s. English hunters would take packs of these dogs out on the hunt tracking rabbits, hare, pheasant, quail and other small animals. The breed probably originated as a cross between the Harrier and other types of English hounds. The dogs have since become one of the most popular breeds in the USA. The breed can hunt alone, in pairs or in packs. The name "Beagle" may have come from the French term "be’geule" which means “gape throat,” referring to the dogs baying voice. The name may also have come from the dog's size, stemming from the French word “beigh,” the Old English word “begele,” or perhaps the Celtic word “beag,” which all mean "small." He has also served as an excellent narcotics detection dog and makes a fine family companion. They were first recognized by the AKC in 1885. Poncho the male Beagle at 2 years old—"Poncho is a rescued dog, he was found in the floods in North Carolina, Oct. 2016. A rescue group from Pennsylvania went there and brought many dogs to PA to find homes. I adopted him in Jan. 2017. He is sweet and stubborn. He loves going to the dog park and wrestling with his friends. He is a master wrestler!! He is loved very much and we are so happy we found him!" 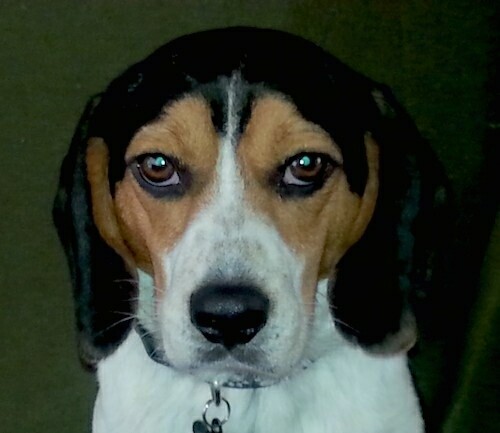 Baylee the Beagle at 8 months old—"We adopted Baylee when she was 3 months old. She has been a pleasure to have around since day one. She howls and pounces at the kitties; they don't understand that she just wants to play! She loves going for car rides, meeting new people and playing with other dogs." 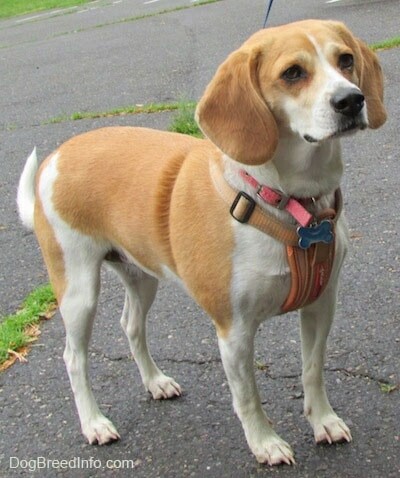 "Bella is a 9 year old Beagle. We keep her in shape by strictly limiting her diet to two measured feedings per day and plenty of exercise. She is a CKC TDX tracking dog and is going to trials for her UTD tracking soon. Some people say these little suckers are difficult to train, but they are extremely intelligent and as with any dog, you have to play to their strengths. With a Beagle it is their nose and their love of finding good smelling stuff. 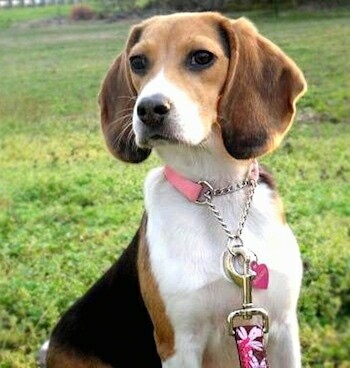 If you have a Beagle or want one... Just a bit of time and effort and I can assure you will tracking with her!!!!" Frank the Beagle is an example of an overweight dog. It is not healthy to let your dog get fat. Since humans have control over how much a dog eats and when, any dog who is overweight is the fault of the owners. To prolong your dogs life be sure to keep them fit. "Gunner was one and a half years old when this picture was taken. 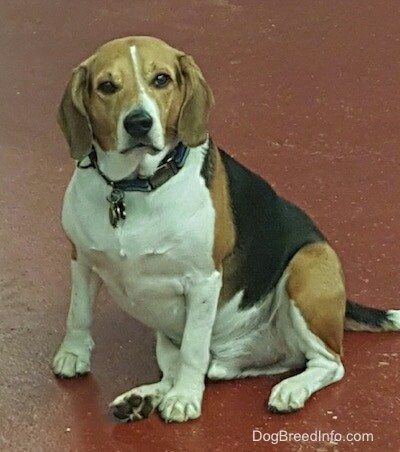 He's a 23-lb purebred beagle. We found him at the Animal Rescue League when my boyfriend and I were looking for a friend for our Pit Bull, Lucy. He is a dominant dog and was difficult to train. Like all Beagles, he has a powerful nose and can be very stubborn at times. He was hard to handle until I started a daily schedule for him: an hour long walk in the morning, breakfast, nap time, playtime, another hour long walk in the afternoon, dinner, then rest time again. He went from making messes in the house, chewing up or eating our socks, and stealing our food to behaving at home as if he was a low energy dog. It seems annoying to change your schedule around for your dog, but it's a great feeling to know that you can help release your dog's energy while bonding with him or her on a morning walk. And the more I walk Gunner, the fewer socks I have to buy." "Leo the purebred lemon Beagle—His eyes are hazel, lighter than the picture shows, almost a lemon color, and his nails are solid white." 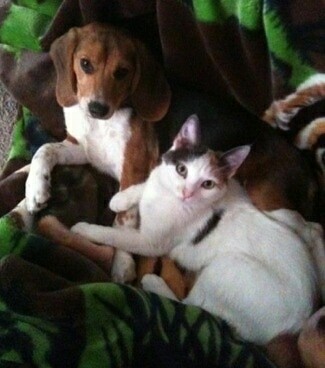 "This is Joey my Beagle with Chacha my cat. Joey is 4 months old in this picture and from the moment he was 7 weeks and we brought him home, he went after Chacha to play. He is a very friendly dog, stubborn but friendly. He cried the first night he came home and that was it, slept in his crate from the beginning. Dogbreedinfo.com has been essential since the moment I decided to get a dog, from selecting a breed and especially on How to walk your Dog, an article I constantly recommend." "Joey always wants to be with his pack. He loves frozen carrots and all I need to distract him is to throw an ice cube on the floor. Great with kids and visitors. All and all, Joey is a real blessing. 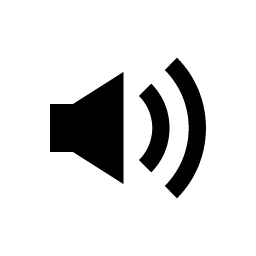 Thanks to this site I knew what to expect so I was ready when things happened, instead of getting frustrated it helped me appreciate Joey's growing steps." 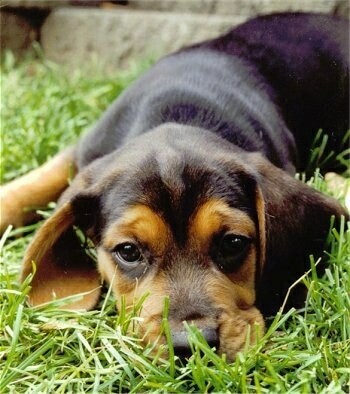 Lucy the black and tan Beagle is a few years older in this picture and has started to gray. Lucy has a little white on her cheek and one foot; the rest of her is black and tan. 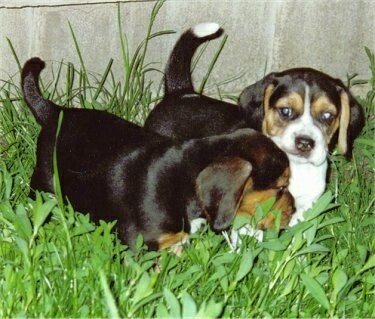 Shadow the black and tan Beagle puppy with his tricolor littermate; the mother is black and tan (Lucy, shown above) and the father is a tricolor Beagle. "Layla, a purebred Beagle—she was 3 months old at the time, curious about why the wires from the computer monitor went into a mysterious hole in our computer desk. Her being the curious puppy she is, she stuck her head into there and she couldn't get out! Of course, this happened on the night of a huge blizzard in NY. We had to call the police to help us get her out. It took them nearly 45 minutes to get here when they are only located 5 minutes away! We tried everything from olive oil to just simply yanking her head out but her ears were too big to get her through. We ended up having to cut the desk open with an electric saw so we could at least get her free. 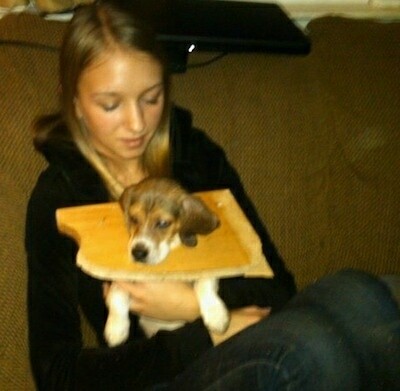 Then, we had to call our friend who works as a nurse at a local vet to come get her head out. Sure enough, she got her head out in a heartbeat." 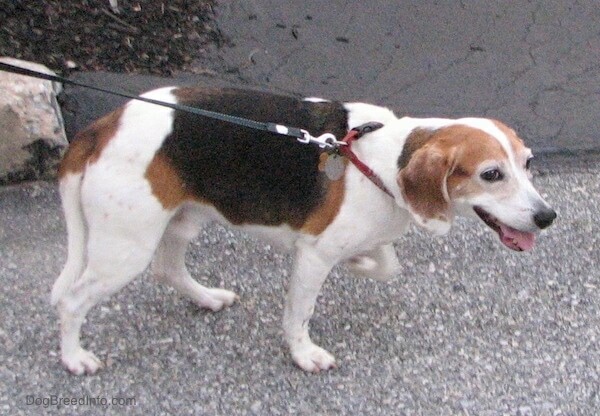 Wembly the Beagle shown here at 8 years old. He is a good bit overweight, which is hard on his joints, especially his knees. He is friendly and loves to hang out at doggie day care with all of his friends.